Approaching a dungeon. For this screenshot, I’m using an odd option to toggle the color palette. For whatever reason, I didn’t give up on this game. I kept playing and grinding for an hour here, an hour there, running around trying to find monsters to fight, fighting them, and retreating to the castle (and it’s pool of healing) when my hit points got too low. Alas, the process took so long that I accidentally deleted some of the screenshots that pertain to the earlier parts of this entry, assuming they were so old that I must have used them already. You may recall from my previous entry that the game’s primary problem, at least in the early game, is an economic one. Food depletes fast, and you need a constant investment of money to replenish it. Also, most of the places that you need to explore have locked doors, and keys cost 100 gold pieces each at the guild. Meanwhile, enemies are hard to find and enemies that drop treasure chests are even harder to find. Even when you find them, they often don’t drop treasure chests, and when they do, the treasure chests are often trapped or contain a pine torch instead of gold. (I learned to love the sight of an orc icon, as orcs drop treasure chests most of the time.) Making 100 gold pieces, enough for a single key, can easily take an hour–an hour in which you’ve expended nearly 100 gold pieces in food. Orcs reliably leave treasure chests. Things loosened when I opened a door in the castle’s underground and found a very large treasure hoard. Around the same time, I ran out of doors to open with keys, so I didn’t have to keep investing in that resource. 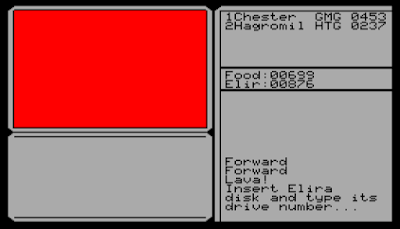 I was able to buy a larger stock of food and better weapons and armor for my two characters. I got my main character up to Level 5 and my secondary to Level 3, and I managed to explore the first level of the only accessible dungeon. To recap, The Seventh Link takes place on an alien planet populated by remnants of humanity fleeing a destroyed Earth. To make the planet “grow” more quickly, the ancient astronauts seeded its core with a contained black hole, but thousands of years later, the singularity threatens to break its containment unless the player can re-energize it by finding seven “energy packs” hidden by the astronauts and use them to re-charge seven “superconducting bands.” The whole backstory is given in epistolary form (captain’s logs and such), but it’s not hard to figure out by reading between the lines. The game gets a little easier for the party. It’s an original plot (at least, as far as RPGs go), but I’m often uncomfortable with the blending of science fiction and fantasy. The world that coalesces around the black hole somehow has giants, dwarves, elves, and magic, which doesn’t make a lot of sense. I have the same issue in Might and Magic, where I find it difficult to reconcile magic, undead, and resurrections with a sci-fi narrative. Anyway, the plot promises to cross multiple planets in the system, but the opening action begins on Elira. 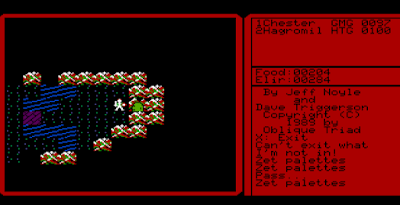 Because of mountain ranges and water obstacles, the player can only explore about one-third of the continent at the game’s outset, where he can find one unnamed castle, one unnamed town, and one unnamed dungeon. The castle has most of the services you need–weapons, armor, food, healing, guilds–but you have to buy the aforementioned keys to access all of it. In town, most NPCs ignore you. Only about four have had anything to say. As I mentioned earlier, the underground also contained a large treasure hoard, and it would have saved me a lot of time if I’d discovered it earlier. The town had another, smaller one. There are a few odd things to do with treasure in this game. First, chests are often trapped. Unlike most other games, if the trap goes off and damages the party, it neither deactivates nor disappears. You don’t get the gold and the trap remains active to damage you subsequent times you try to open the chest. However, each chest’s trap status seems to be assigned upon loading the game, so simply saving and reloading will clear a lot of the traps. Second, the “steal” command works oddly in this game. It seems to have been designed to allow the character to steal across counters in shops, but the weird byproduct of the system is that it only works on people and objects two squares away from the party icon. And it works across any boundary. So if you see a chest on the other side of a wall, you can hit (S)teal to somehow cross the barrier and get the chest. Trying this in town is a bad idea, though, as it fails most of the time and aggravates the guards. This status seems to be permanent. Even though I can’t get into the area, I can steal the first row of chests “across” the wall. 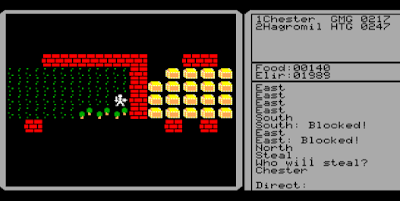 Unfortunately, unlike Ultima III (the game that Link most resembles), chests down respawn when you leave the area–not in towns, not in dungeons. “Found” gold is thus finite. Eventually, I ran out of things to do in the castle and town. Neither location has a place to buy ships (and you can’t take the one in the castle underground out of the underground), so I’m not sure how I’ll eventually explore the rest of the continent. I suspect that the dungeon has multiple exists, one of which may lead me to the other side of the mountains. You do not want to step in lava in the dungeons. Like the early Ultimas, dungeon exploration switches to first-person view. The graphics are odd and hard to get used to; it looks like walls directly in front of you are several moves away. There are the usual accoutrements: chests, doors, ladders, fountains, pits, traps. Monsters patrol fixed locations and do not respawn when you leave the dungeon and return. They aren’t very numerous. This wall is actually directly ahead of me. I cannot move forward. 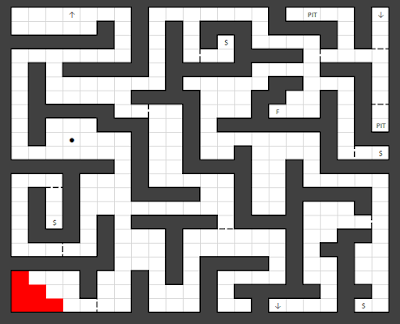 The first two levels were a large 22 x 22, though in the “worm tunnel” variety, with spaces between walls. Both levels had yellow pillars that don’t seem to have any function. They also have squares of lava that equal instant death. Level 1 had battles with fighters and evil clerics, but Level 2 introduced slimes that have to be killed with magic. They just keep dividing when attacked with weapons. 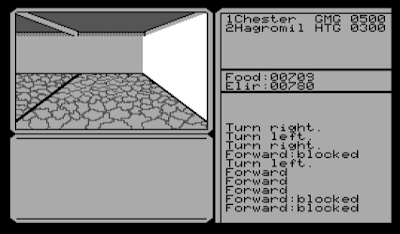 You can’t save in dungeons, but I abused an emulator save state to see what would happen if I fell down a pit. Oddly, the party didn’t take any damage, but the damned thing took me down 13 levels. That’s a pretty big dungeon for this kind of game, and I get the impression that it isn’t the only one. I got attacked by demons and killed on the lowest level, but I’m sure I can survive it eventually. My bigger concerns are travel and torches. I haven’t seen any evidence that the game offers spells to move up, down, or out of the dungeon, and it’s going to get awful annoying to backtrack in and out after a few levels. Perhaps worse, I’m not sure how to carry enough torches for the journey. The characters’ shared inventory is finite, and while you can pack it with a lot of items, torches puff out quite quickly. (The game features both cheap pine torches and expensive enchanted torches; I haven’t noticed that the latter last any longer or do anything different.) I could easily see running out on, say, Level 5. There’s a “Light” spell in the cleric spellbook, but I’d have to find a cleric. So that’s where I am. I spent a long time grinding to get my characters to a place that they could survive, but it looks like I’ve simply swapped one long, boring process for another one. Especially after all the mechanical dungeon-delving in The Game of Dungeons, I’m not particularly in the mood to again map a huge, multi-leveled structure in which nothing much happens. However, I’ll resist the urge to title this “Summary and Rating” and give it at least a few more hours.